The Byzantine Empire was the continuation (and even represented endurance) of the Roman legacy, so much so that most of its citizens called their realm Basileia tôn Rhōmaiōn – the Roman Empire. In essence, if we take the impartial route that is ‘bereft’ of prejudiced medieval European politics, the later Eastern Roman realm, or more specifically the Byzantine Empire, possibly had an army (at least for a significant part of its history) that was worthy of its ancient predecessor – the Roman Empire. As historian Ian Heath wrote (in Byzantine Armies 886-1118 AD) – in spite of misunderstood labeling and anachronistic slanders, the Byzantine (or Eastern Roman) army of 10th century AD was possibly the “best-organized, best-trained, best-equipped and highest-paid in the known world”. I’ve chosen to call them Byzantines instead of Eastern Romans for the sake of convention, and I’ve chosen to focus on native heavy infantry, excluding mercenary and guards units (sorry, Varangian fans). The armor and weapons are mostly stylised though I’ve tried to include as much detail as possible. One point to note: my portrayal of the 1453 household trooper as heavily orientalised is controversial, but given the direction Byzantine costume was headed (check out the medallion of Emperor John VIII, and note how Trapezuntine warriors in 1461 were almost indistinguishable from their Turkish opponents), I think it makes a lot of sense. Now while the time-lapse video does a fair job of presenting the evolutionary pattern of the Byzantine army armor, we have decided to delve into some logistical, socio-political, and manpower aspects that rather bolstered the provincial military of this medieval Roman state, composed of excerpts from one of one of our previous articles – 10 Things You Should Know About The Early Medieval (Eastern Roman) Byzantine Army. The Byzantine military from the 7th century to early 11th century AD was dependent on the Themata(or Themes) system, an administrative network of provincial armies that ironically preserved the Eastern Roman realm (more-or-less across Anatolia) and yet mirrored its ‘on the defensive’ state of affairs. Partly inspired by the provincial system set in place by Constantine the Great, the Themata – as we know today, was possibly established during the reign of Constans II, as opposed to the popular notion associated with Emperor Heraclius. In any case, the rise of this defensive force, initially based on the provinces of Anatolia, was probably fueled by the incursions of the Arabs on the eastern frontiers of the Empire. Now each of these theme armies was commanded by a military governor known as the strategos (or general), who also boasted his personal retinue of heavily armed swordsmen known as the spatharioi (spatha or sword ‘bearers’). And on occasions, some of these retinues rose to hundreds of men, as was in the case of the Thema Thrakēsiōn, whose strategos had a retinue of two banda – approximately 600 men. The military governor was additionally assisted by other high-ranking officials who took the responsibilities of the province’s revenues, taxations, and most importantly payments for the provincial army. However, the core member of the Themata pertained to the regular provincial troop, who usually belonged to the farmer-soldier background. These freemen were offered plots of agricultural land (often hereditary) in return for their mounted (in theory) military service, which sort of mirrored the feudal system followed in contemporary Europe. But the size of such plots tended to be smaller than the knightly holdings of western Europe – thus resulting in greater number of Themata troops albeit with relatively lower quality equipment and training. At the same time, it should be noted that not all such provincial troops of the Byzantine army were uniformly ‘poor’. In fact, as mentioned in Tactica, some of the Thema armies comprised rich landowners who could afford superior armor and weapons – and as such, they were considered as the first line of defense by the Emperor himself. Furthermore, in spite of the non-uniformity of equipment showcased by different provincial troops, there was a minimum threshold of requirement expected from each farmer-soldier who held a land. For example, in 9th century AD, the Byzantine administration passed a law that allowed poor Themata soldiers to band together to pay for a properly equipped mounted warrior. In rare cases (as legislated by Emperor Nikephoros II), some of the richer troops were obligated to furnish better equipment for their poorer military brethren. And during extreme situations, if the soldier couldn’t afford his arms and armaments – even after being offered aid from others, his land was promptly taken away. Consequently, he was drafted into the irregular divisions who were derogatorily called the ‘cattle-lifters’. So in essence, as opposed to 10th century feudal Europe’s wide gap between the early knightly class and the ‘rag-tag’ peasant infantry, the Byzantine army boasted a fairly consistent provincial military institution that was inclusive of variant soldier types – and the entire system was rather strengthened by an administrative network (though the scenario took a downturn by the second half of the 11th century). Themata infantrymen. Illustration by Angus McBride. As we fleetingly mentioned before in the article, the Byzantine army was relatively well paid, especially when compared to the European realms of the contemporary time period. In terms of actual figures, a regular Thema soldier was possibly paid one (or one-and-a-half) gold coin, known as the nomismata, per month. Each nomismata weighed around 1/72th of a pound, which equates to 1/6 to 1/4th of a pound of gold for the individual soldier per year. This increased to 3 pounds of gold per year for a ‘fifth-class’ strategos and 40 pounds of gold per year for a ‘first-class’ strategos. It should also be noted that additionally, these farmer-soldiers held their grants of land, which theoretically were valued over 4 pounds of gold. Now of course, much like their ancient Roman predecessors, that payment system must have had its limitation. For example, Emperor Constantine VII (or Porphyrogenitus – ‘the Purple-born’), the son of Leo VI the Wise, talked about how the Byzantine army at the provincial level was paid once in four years in the ‘old times’. This could have meant that the provincial troops served in a cyclic manner, thus alluding to the rota system that possibly came into force every three years, which in turn might have provided a fresh batch of permanent soldiers for each year. However, on the other hand, Arabic sources mention how most of the Byzantine forces (circa 9th century AD) were only paid once in four or five years, thus suggesting how the comprehensive payment scale occasionally put a strain on the treasury of the Empire. In any case, the payment was also complemented by a rationing system, with dedicated rations being provided to the Thema soldier during his active duty. And like in many contemporary military cultures, the provisions were often bolstered by spoils and plunders gathered during both quick raids and extensive campaigns. And interestingly enough, once again in stark comparison to early medieval European armies, disabled soldiers were expected to be endowed with pensions, while the widows of those who were killed in action were given a considerable sum of 5 pounds of gold (at least during the peak of the Byzantine army in circa 9th century AD). 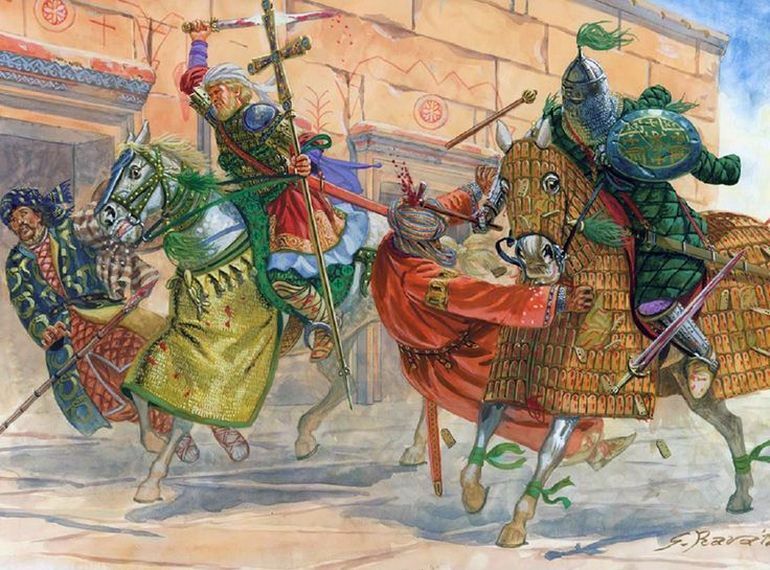 Byzantine Imperial cavalry guardsmen (circa 10th century AD) running down Fatimid soldiers. Illustration by Guiseppe Rava. Till now we have talked about the Themata army of the Byzantine Empire (circa 8th – 10th century AD). But the provincial troops were supported by the better-equipped and highly-trained Tagmata, the permanent guard regiments based in and around the capital of Constantinople. In essence, these elite units took the role of the nucleus of the early medieval Byzantine army, and were possibly formed by Emperor Constantine V. Pertaining to the latter part, the Tagmata were thus perceived as the Eastern Roman Emperor’s own regiments who took the field only when their ruler set out to a campaign. But reverting to practical circumstances, during such military scenarios, some of the elite Tagma units must have also stayed back at Constantinople to guard the capital, while a few others were probably even committed to garrison duties in the proximate provinces like Macedonia and Thrace. The Scholai (Σχολαί, ‘the Schools’), probably the senior-most unit in the Tagmata, were the direct successors of the Imperial Guards established by none other than Constantine the Great. The other three principal regiments that were considered among the Tagmata ‘proper’ are as follows – the Exkoubitoi or Exkoubitores (‘Sentinels’), the Arithmos (‘Number’) or Vigla (‘Watch’), and the Hikanatoi(‘the Able Ones’) who were established by Emperor Nikephoros I in early 9th century AD. There were also some other regiments that were occasionally counted in the imperial Tagmata roster, including the Noumeroi, who were possibly tasked with manning the walls of Constantinople; the Optimatoi (‘the best’), who, in spite of their name, were relegated to a support unit that maintained the baggage train and garrisoned the nearby areas outside the capital; and the Hetaereia Basilike (“the Emperor’s companions”), who probably comprised a mercenary regiment composed of foreigners. There were also situations when men of the Imperial Fleet were inducted into the Tagmata units. Now when it comes to the number of soldiers of the Byzantine Tagmata, there is a lot of debate in the academic world. Early medieval sources rather mirror this state of confusion, with Procopius writing in the 5th century on how the Scholai was made up of 3,500 men. 10th-century Arab author Qudamah talked about how this number possibly rose to 4,000 per Tagma regiment in the 9th century. However, yet another Arab author, Ibn Khordadbah mentioned how the total strength of the Tagmata army was 6,000 (which makes it 1,500 men per regiment), and they were supported by 6,000 servants. And finally, another historical source of the 10th century described how the Emperor in the campaign should be supported by at least 8,200 horsemen. Presuming these horsemen to be from the Tagmata, we can surmise that in normal scenarios, the Emperor possibly boasted over 12,000 elite troops – and the number possibly even crossed 25,000 in the later decades of 10th century. 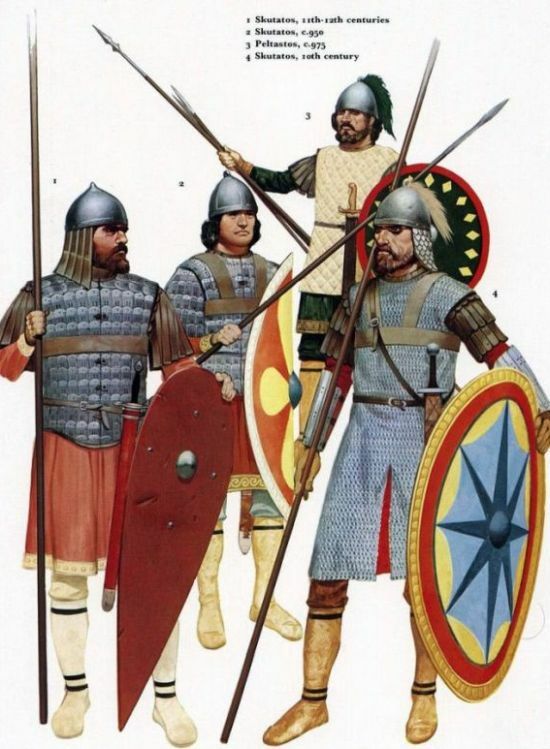 Various Byzantine mercenaries. Illustration by Angus McBride. 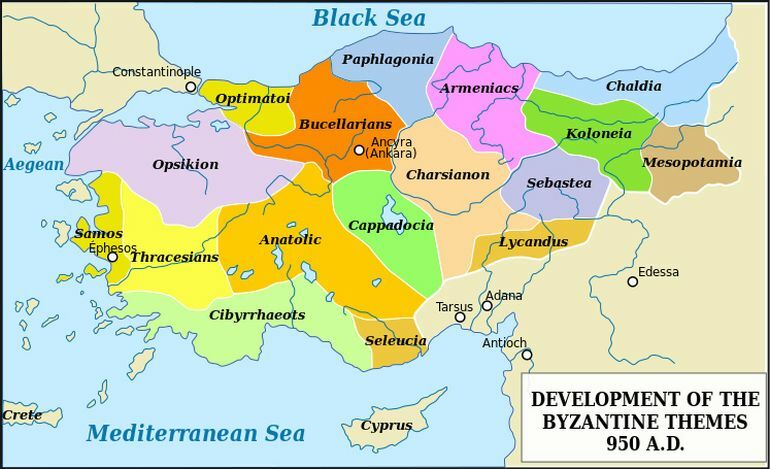 By the end of the 10th century, the manpower derived from most Themes in Anatolia began to dwindle; while by the end of the 11th century the quality of native Byzantine troops declined – so much so that their land-owning positions were gradually taken over by Armenians (and related Cappadocians), Varangians, Slavs and even Franks. Emperor Nikephoros II Phokas, who was also a brilliant military leader, perceived this ‘slackening’ trend, and already took steps that would allow the employment (and even recruitment) of mercenaries in the Themata army. 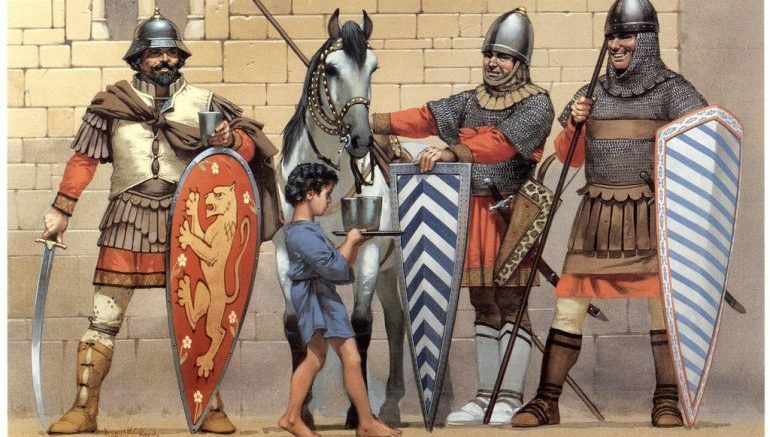 In fact, according to credible estimates made by historians, by the end of the 10th century (and early 11th century), possibly more than half of the fighting men in the Byzantine army were mercenaries who came from different ethnic backgrounds. Now if we proceed to a century later, Frankish sources talked about the variant mercenary elements found in Emperor Alexios I Komnenos’ army, including the Patzinaks, Alans, Kipchaks (Cumans), Bulgars – and these groups possibly formed the core of the missile cavalry. 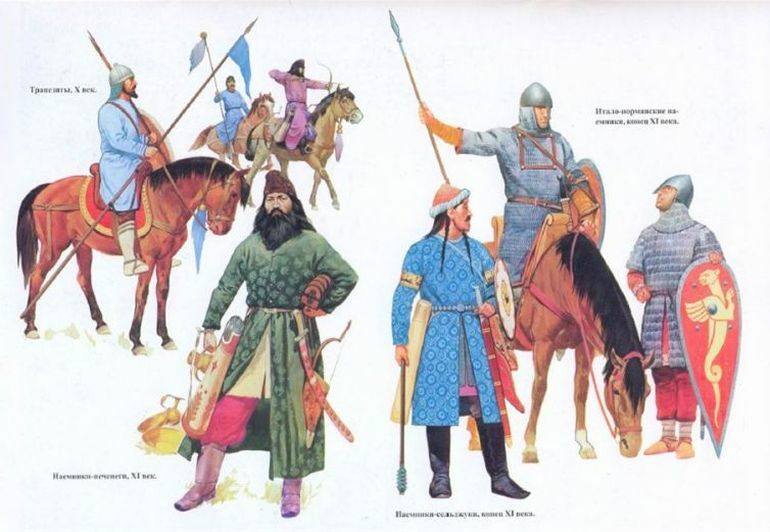 To that end, Nikephoros II’s light cavalry divisions were mostly composed of the Patzinaks (or Pechenegs), semi-nomadic Turkic people who originally hailed from Central Asia. These light cavalrymen were complemented by their ‘heavier’ brethren, along with the infantrymen and marines – derived from the Anglo-Saxons, Rus (early Varangians), Franks, Italians, Dacians, and even Normans. And quite intriguingly, this system of employing mercenaries even took an administrative route (possibly as an alternative to the depreciating Themata army) that streamlined the foreign troops into self-contained contingents known as the symmachoi (‘allies’) that were commanded by their own officers and leaders.